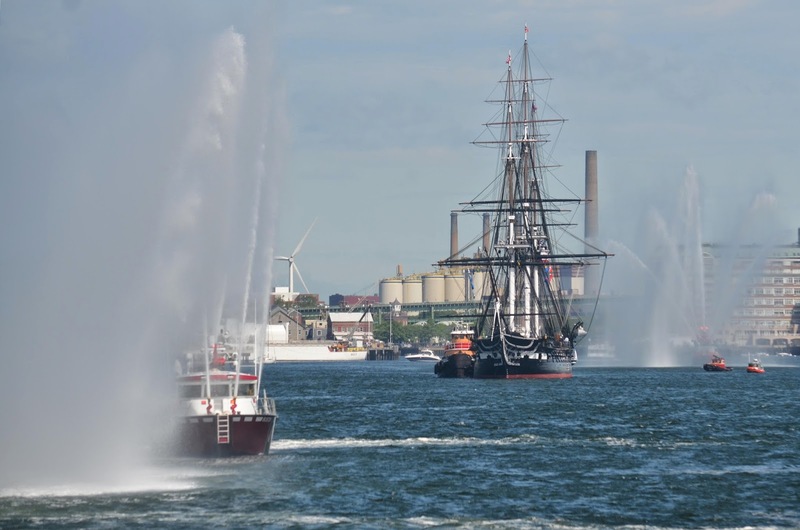 When we left the harbor this morning, our guests were treated to an amazing view of the USS Constitution, the oldest commissioned naval ship still afloat in the entire world! The Constitution was also one of the first commissioned naval ships of the United States Navy! Usually the Constitution only leaves port once or twice a year to celebrate the the 4th of July and other national celebrations. The constitution embarked this morning to commemorate the 70th year anniversary of D-Day, the day over 160,000 allied troops invaded German-occupied western Europe at Normandy, France. After leaving the harbor and heading out into the open ocean, we found three very mellow humpback whales on the southwest corner of Stellwagen Bank. Cajun, Orbit and Canine were traveling in seemingly random directions making very shallow dives. 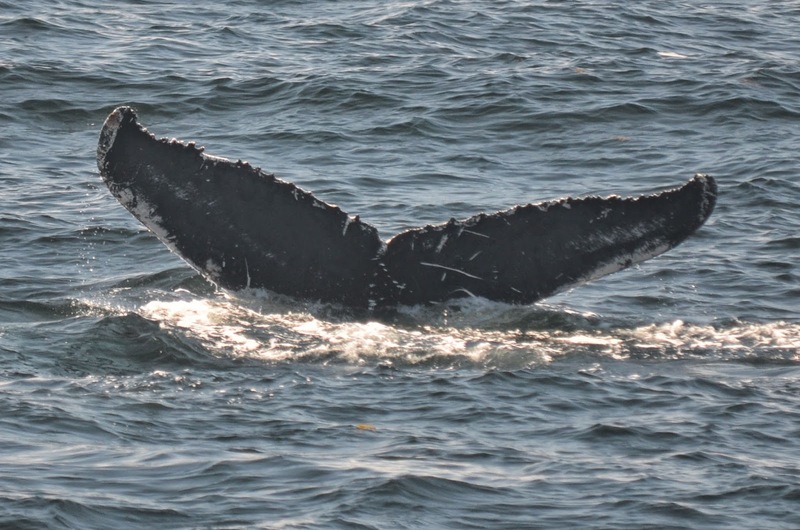 After about fifteen minutes, a humpback named Weathervane joined the trio. Judging by their behavior, these whales were mostly likely searching for food. Over the past few days, there has been lots of bait in the water but today we didn’t see any. Just because we didn’t see any doesn’t mean it wasn’t there but I suspect the whales weren’t seeing any either. We saw them create a couple bubble nets unlike those we have been seeing. One bubble net was a very fine circular net of bubbles with a small bubble cloud in the center but only one whale casually surfaced inside this net. 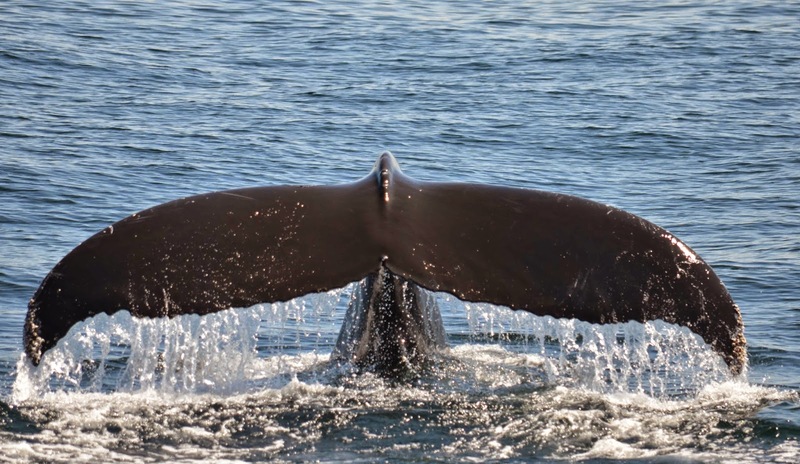 It’s possible that the other whales were subsurface feeding but it appeared to be more of an unsuccessful attempt at feeding because they continued to travel on. There are definitely lots of fish in the area and as soon as these four humps find some bait, probably later today, they will start feeding again so that they can continue to build up those fat reserves throughout the summer. 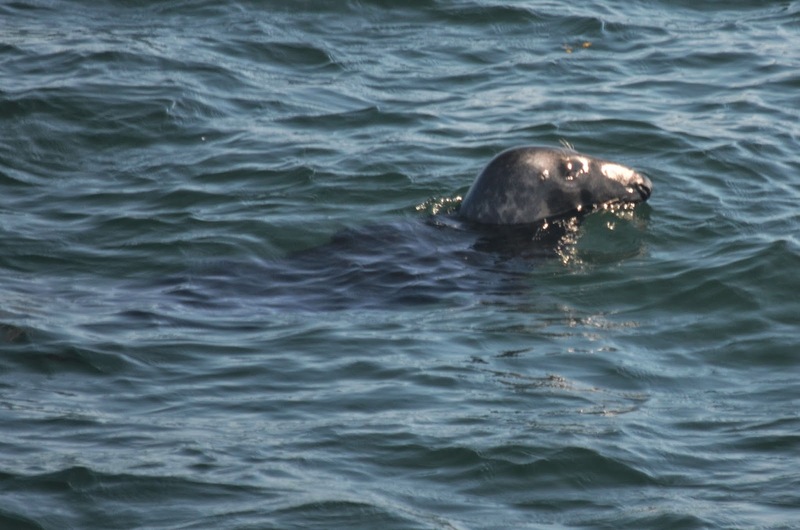 Additional species we saw on our trip included a traveling a fin whale that we passed on our way out to the bank and a gray seal that a number of passengers compared to a puppy dog. You be the judge (see photo)! On the Aurora's 12 p.m. trip we headed to the Southwest corner once again. Just after crossing the edge of the bank we were surprised with a quick encounter with a finback whale. We didn’t spend much time with it due to other sightings in the distance. 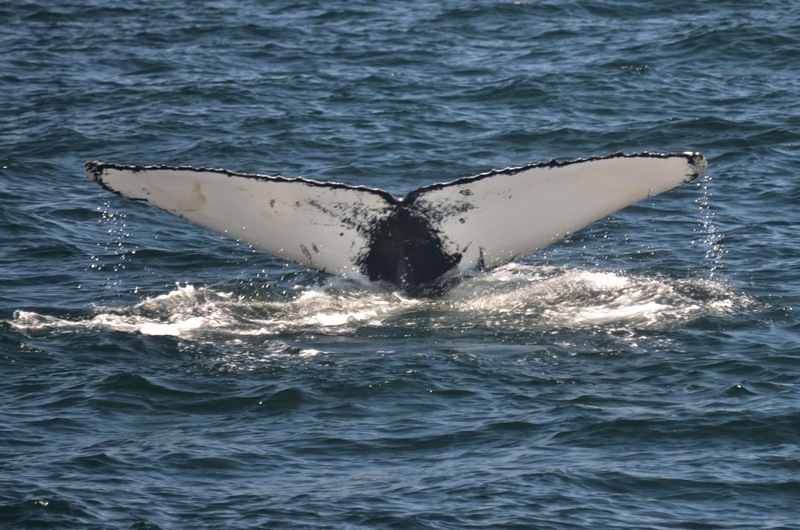 Next, we spent some time with Measles, a humpback first spotted in 2002. This individual was casually bubble cloud feeding and treated the passengers to a close-to-boat encounter on the port side. See the photo above of Measles surfacing with a mouth full of sand lance. We even saw a few sand lance attempting to escape from its mouth! While with Measles, we also saw a couple more finbacks and a minke that were traveling by. We spotted another humpback in the distance and headed over. It turned out to be Mogul. This is the first time we’ve spotted this male humpback this season! Mogul was born in 1986 to Parrot who was first spotted in 1983. He was bubble cloud feeding and showed us his tail multiple times making it easy to ID him! See attached photo of his mostly white fluke. It was a beautiful day on the water. A great sign for this weekend! On the Asteria's 1:30pm we went east of midbank and found Measles traveling alone. There were a couple of fin whales noted in the area and one of them came fairly close to our boat. Measles was taking 3-4 minute dive times and fluking beautifully next to our boat. The weather was sunny with calm seas, making it easy to see the length of Measles right below the surface.